Tiny representations of flowers and trees that are a fraction of the width of a human hair have been created by scientists in Cambridge, UK. 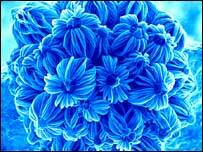 The nano-sized plants are "grown" from tiny droplets of the liquid form of the metal gallium on a silicon surface. The scientists then expose the droplets to a gas containing methane and a reaction causes the gas to condense to form tiny wires of silicon carbide. The images appear in the Institute of Physics journal Nanotechnology. By varying the temperature and pressure of the growth process the wires can be fused together to form a variety of complex shapes in the range of 1-5 microns (millionths of a metre). The images were taken by Ghim Wei Ho, a postgraduate student in nanotechnology at the University of Cambridge. 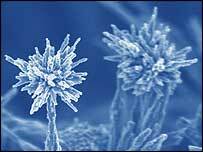 Professor Mark Welland of Cambridge's Nanotechnology Centre said the nano-wires might have a number of applications. "Two that are currently being explored are their use as water repellent coatings and as a base for a new type of solar cell," he explained. "We have already shown that as a coating, water droplets roll off these surfaces when they are tilted at angles as small as five degrees. "This behaviour is a direct consequence of the ability of such nano-structured surfaces to strongly repel water." The photos won a recent photography competition within Cambridge's department of engineering.